The Atlantic Council’s South Asia Center hosted an off-the-record discussion with Frank J. Ruggiero, Acting Special Representative for Afghanistan and Pakistan in the US Department of State, and Vali Nasr, Senior Advisor to the Special Representative for Afghanistan and Pakistan. Having recently returned from meetings in the region with government counterparts in Pakistan, they discussed the prospects for improved cooperation between the US and Pakistan in the coming year. Shuja Nawaz, Director of the South Asia Center, moderated the discussion. While the United States and Pakistan continue to work toward achieving shared objectives in South Asia, recent events underscore the gravity of Pakistan’s internal struggle for stability and security. The assassination of the Governor of Punjab province, political turmoil in the coalition government, and the country’s fragile economy present increased challenges for the United States as it aims to collaborate with Pakistan on a variety of issues in the region. Frank J. Ruggiero, Senior Deputy Special Representative and Deputy Assistant Secretary of State for Afghanistan and Pakistan since July 2010, became Acting SRAP when Ambassador Richard C. Holbrooke passed away on December 13, 2010. Prior to that, from July 2009, Mr. Ruggiero was the Senior US Civilian Representative for Southern Afghanistan. From January to June 2009, he was the Acting Assistant Secretary for Political-Military Affairs (PM) and served previously as the Principal Deputy Assistant Secretary in the PM Bureau and PM Deputy Assistant Secretary for Defense Trade and Regional Security. Mr. Ruggiero has been a leading figure in the State Department on US security strategy in the Middle East and South Asia. He is a career civil servant and has served in several positions in the Department of State and Commerce. He holds an MA in Middle Eastern Affairs from American University and has completed all requirements for a Ph.D. (but the dissertation) in US Foreign Policy in Asia from the University of Virginia. 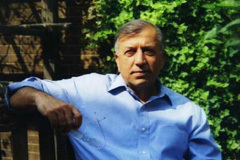 Vali Nasr, Professor of International Politics in the Fletcher School of Law and Diplomacy at Tufts University, has served as a Senior Advisor to the Special Representative for Afghanistan and Pakistan in the US Department of State since 2009. He is a Senior Fellow at the Belfer Center at Harvard University, a Life Member at the Council on Foreign Relations. Previously, he was an Adjunct Senior Fellow at the Council on Foreign Relations (2006-2009), served as the Chair of Research in the Department of National Security Affairs at the Naval Postgraduate School in Monterey (2003-2007), and was the Director of Islamic Educational Reform in South Asia Project of the National Bureau of Asian Research (2005-2007). Dr. Nasr holds a BA from Tufts University, an MALD from the Fletcher School, and a PhD from the Massachusetts Institute of Technology.